Spencer Learning Ultimate Phonics Reading Program is a downloadable software that has easily been added to our routine homeschool day. My 8 year old is a struggling reader, and it is hit and miss when we add in additional programs. Ultimate Phonics Reading Program is a no frills, basic program that works on sounds through words and sentences. No games, no bells and whistles, just simple reading. This type of program is exactly what we needed for additional practice. We started in the beginning with lesson 1. We started with short vowel sounds. Each of the words that follow all have that vowel sound in the three letter word. The words are given in a list first so that you can see the words that will be coming. After the lists, the words are shown, one at a time. After they read it, they can click on the arrow at the top to take them to the next word. I chose to sit with my son to help him with the program. There is a speaker you can click on to read the word to you for a child who can self check. You can either click on the entire word top and it will read it, or just hover over the letters in the yellow and it will tell you the sounds. After the words, there are sentences that include words from previous lessons as well as the current words. Again you can hover over the word and it will say it for you. I had my son read it first, then hit the sound symbol to see if he was correct. It was very helpful for him to see the numbers at the bottom of the page, to know how many more sentences he had to do. 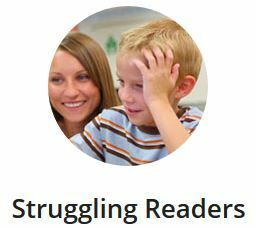 Though the entire lesson only take 10-15 minutes, a struggling reader will struggle even through that short of a time frame. After the student learns short vowels, they learn beginning consonant blends like sl, br, fr and including three letter blends like spr. After the blends the student starts to learn Sight Words. This is where we really need the work. This is set up just like the rest of the program, but using the sight words. There are only a small amount used at a time. The next several lessons do a practice review, and then there is another sight word page. The sight words aren't thrown at the student all at once, rather in small bites which I thought was very helpful. Consonant blends are then studied as ending sounds as well as more beginning sounds. The program builds upon itself and the student's reading repertoire just keeps increasing. Scrolling through I see that the program also includes the silent e, double consonants, consonant blends, endings, compound words, apostrophe, syllables and more. This is a great, comprehensive, yet simple to use phonics program. There are no games, awards, or cartoon characters. That helps the Ultimate Phonics to be used by all ages. Adult readers who need help, those with English as a second language, and beginner readers all can benefit from this easy to use program. I am so excited for my little guy to progress and eventually get through all 262 lessons! Little by little we are getting there. Click on the banner below to see how my Crew mates used Spencer Learning.